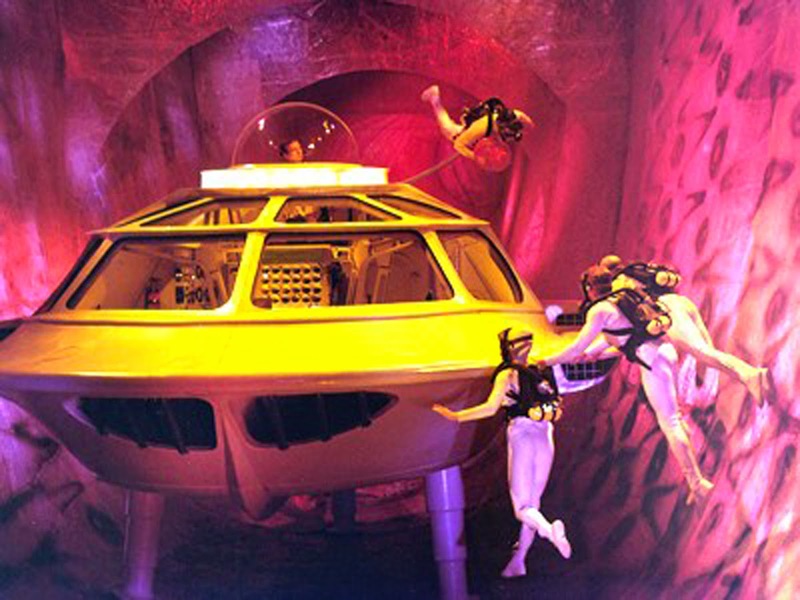 A unique science fiction adventure about a group of miniaturized scientists traveling through a human body, Fantastic Voyage is full of bright ideas brought to life with energetic execution and admirable special effects. The US is embroiled in a secret race with the Soviet Union to master miniaturization technology for military purposes. Scientist Jan Benes defects to the US, but suffers a brain injury in the process and slips into a coma. Benes has key knowledge that could help in overcoming the 60 minute limit currently hampering miniaturization efforts. At the secret Combined Miniaturized Deterrent Forces facility, General Carter (Edmond O'Brien) recruits agent Grant (Stephen Boyd) to provide security on-board the experimental submarine Proteus, which is about to be miniaturized and injected into Benes' bloodstream to find and remove the damage affecting his brain. The rest of the submarine team consists of Captain Owens (William Redfield), human physiology expert Dr. Michaels (Donald Pleasence), laser surgeon Dr. Duval (Arthur Kennedy) and his assistant Cora (Raquel Welch). Carter and Grant suspect that there is a traitor within the group, and once the journey starts inside Benes' body, little goes according to plan. Michaels suffers from claustrophobia, the submarine is buffeted by turbulence and knocked off course. The laser surgery tool is sabotaged, and the sub suffers an air supply leak. A re-route requires a dangerous trip through the heart, forcing Carter to order that Benes' heart be temporarily stopped. With time running out, the crew decide to take a hazardous short-cut through the inner ear to the brain, but again there are problems, as the mission is jeapordized by the unknown traitor and Benes' own body working to defend itself against the foreign objects floating within it. Combining a 1950s sci-fi mentality with 1960s special effects, Fantastic Voyage is visionary kitsch. With the space race in full swing and the cold war at high heat, there is no denying the inventiveness of turning the exploration theme inwards, and transforming the concept of flying through endless space into navigating the smallest capillaries of the human body. The Harry Kleiner screenplay (with four others sharing story and adaptation credits) efficiently introduces the set-up, and cleverly integrates the not-yet-perfect miniaturization science into the cold war tension, with secret military labs and threats from saboteurs thrown in to create numerous opportunities for drama. Director Richard Fleischer and cinematographer Ernest Laszlo then weave together the visuals, and create a creditable environment with a succession of stunning backdrops mostly inspired by ocean depths. For the most part, the special effects have held up remarkably well. The adventures of Proteus within the human body are never dull, the incredible obstacles and dangers of traveling through the human body becoming a thrill ride heightened by the subversive attempts to sabotage the mission. Fleischer constructs the film in the form of an obstacle course with a surprise around every corner. The scientists are forced to rely on their ingenuity to problem solve on the fly, including frequent excursions out of the submarine to circumvent, fix, or innovate their way through the latest crisis. Slightly less successful are the goings-on back in the secret lab as anxious military and medical types monitor the mission's progress. 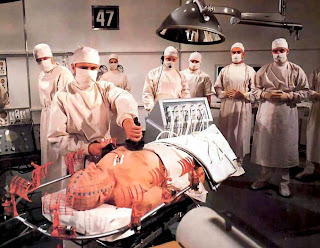 Some of the buffoonish attempts at tension and humour in the control room do not work, and fully deserve the parodies that they inspired in films like Airplane!. The performances are generally bland, and this is a good thing, since there is enough stimulation in the premise, backdrops and special effects not to require flashy acting. Stephen Boyd, Donald Pleasence, Arthur Kennedy, Raquel Welch and William Redfield maintain an even keel. For the most part Welch remains subdued and is surprisingly convincing as a scientist's assistant. She stays under the wraps of her mundane submariner outfit, although late in the film she starts forgetting to fully zip up her top. Kennedy's Dr. Duval attempts some clunky philosophizing inspired by the journey through the human body, at regular intervals spouting weighty but meaningless musings about humanity, life and the order of things. 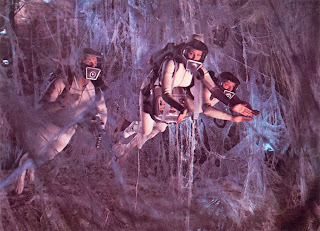 Innovative, audacious and sometimes campy, Fantastic Voyage lives up to its name.